India has withdrawn the tender for a new air refueling tanker, more than three years after choosing the Airbus A330 MRTT in preference to the Ilyushin Il-78 following a second round of bidding. This latest example of indecision on major defense projects, following the saga of the Medium Multi-Role Combat Aircraft (MMRCA) program, is creating concern in the international defense industry that India is chronically indecisive. 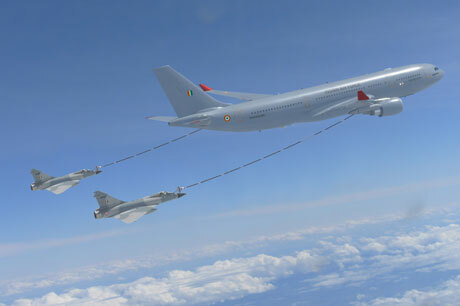 However, AIN has learned from a senior Indian Ministry of Defence official that the A330MRTT procurement may still be concluded, on an intergovernmental basis between Spain and India. Though there has been no official confirmation, Indian media reported that the high price of the MRTT is the reason behind the nation's failing to conclude a contract. However, the vendor has not been given the cause for the pullout. “The cost of the MRTT has increased following depreciation of the rupee in the past three years,” said the senior MoD official. An IAF engineer said the six IL-78s already in service in the IAF are suffering from maintenance issues related to unavailability or delays in acquiring spares. “Sometimes there are structural issues and at other times, problems with the Israeli pods that keeps the fleet grounded.” He said that at the recent Red Flag Exercise in the U.S, only one of the two IL-78s sent by the IAF performed. AIN could not confirm this. “The MRTT is urgent because we need to enhance our capability,” IAF chief of staff Air Chief Marshal Arup Raha told AIN in April. A finance ministry official said it did not make financial sense to have a mix of models in the fleet as the cost for setting up a maintenance facility for the A330s “would be enormous.” This was refuted by a retired IAF official who said that maintenance facilities already exist in India for the airframe as Airbus has a large commercial presence here. “This is utter lack of understanding,” he said.